Families are especially welcome on all our Canyon Dave Tours. We love kids and we play games with them as we teach them. Some parents have doubts that their active young children will be able to enjoy a tour without becoming bored or agitated. We have found the opposite to be true. Our methods of combining learning with play are so successful that even young kids enjoy the full day excursions and are sad when they are over. 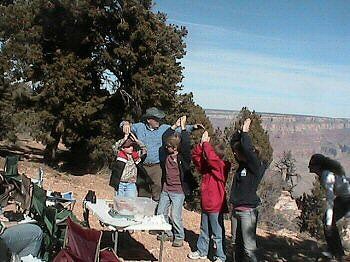 For example, at Grand Canyon your children will learn of the four chapters of Grand Canyon geologic history and will be invited to act out each chapter, to the delight of everyone. This is always a memorable photo or video opportunity. As we walk the safe paths (that are not too close to the edge! ), the kids have plenty to see and do. A child's innate curiosity often inspires the most interesting questions that we get from any guest. For our drives between viewpoints, we have wildlife pictures and children's' books on interesting topics to keep them busy and happy. Our explanations of animals, plants and history are given in a way that kids can easily understand, without over-simplifying, so the adults are also well-informed. Your family vacation is special and important to you, and to us. We pride ourselves in providing an immensely enjoyable day for everyone, both young and old. To reserve your tour, call a Canyon Dave tour specialist today! He/she is loaded with Grand Canyon information and has the best bookings and prices. Bookings fill early, especially for March thru October. Copyright ©2019 Canyon Dave Tours, all rights reserved.